Let me start by saying there are lots of ways to assign a grade to a proficiency rubric. It is not a perfect conversion, so this is how I do it to keep it simple. 1. Students take a proficiency-based assessment (speaking or writing). The last row “comprehension” is only used for interpersonal assessments. 2. I check the boxes where I feel they are hitting. I do not factor in the “Minor Focus” as part of their grade. 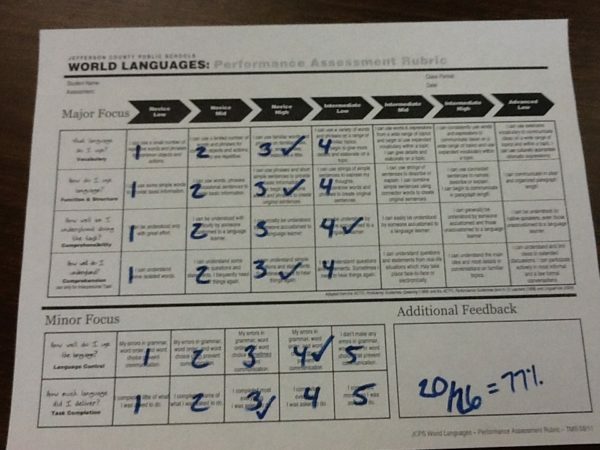 I had a training called MOPI from ACTFL that really helped me distinguish their proficiency levels. I highly suggest you have someone help you or take a training to learn how to do this. Also Greg Duncan is a consultant that can assist your school/district with this. 3. According to the expectations for the class level, I assign a grade. So if they are in the Novice High column in level 1B, they earn a B. 4. If they are between two levels, I split the difference. So this student below would get a B+. Their grade in my class is based on what they can do on these performance assessments. I have trained my students to focus on their level, instead of their grade. I even write their proficiency level on the comments on their grade reports. If you ask my students their grade, you’ll hear them say… Well I am a Novice High so I have a B. They RARELY ask me for their grade. Yay! If they do not complete an assessment, that really lowers their grade until they attempt it. I also let them retake an assessment if they want to improve. Here’s one example of how you can add a percentage. Again, this is a guideline. Here are some examples of different categories I’ve used at different times/schools. This one was to make a past district happy that required these categories. This one I used at a standards-based school. I liked tracking their progress without putting a grade. The focus is on the LEARNING, not the GRADE. You have read my mind! My next post will explain this, I promise. It helps if I can show the photos in the post. Wow, this was a really informative post. Thanks so much for all the pictures to show your process in action. I don’t think my district does anything with proficiency levels (next year will be my first year teaching a leveled all-year high school class) but this is definitely intriguing. I really like the way you said it motivates your students to focus on learning! Even if your district doesn’t, try it out! I LOVE proficiency grading. I don’t spend hours grading tests anymore. Truly my students are so use to it that they could grade their own (self-assess). This creates a differentiated test without creating separate tests too. 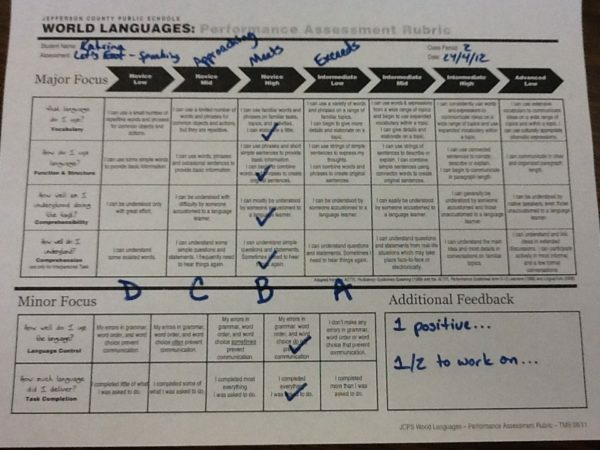 Do you have a digital copy of the rubrics you use? Maybe you could email them, or post them? Grading on the proficiency scale is something I always struggle with. I am either too tough or too easy. Just make the number match the proficiency. I promise it can work. They give us all these restrictions on our grades and tell us how much a category can be weighted. But there’s always a way to make it work. 😉 I’m going to check out that book. Love it! 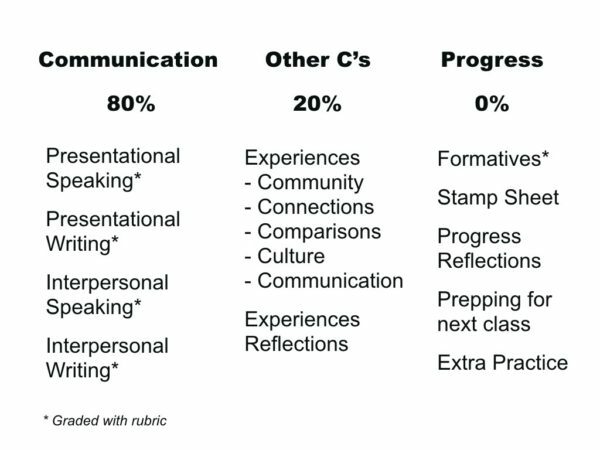 I’m glad to hear new ways of using the rubric. Before I begin, I must say that I have been following this blog for the past few months and read it every day. As a first year teacher, it is great to see more experienced teachers collaborating in this online space, and I appreciate the freshness and ideas that are available here. 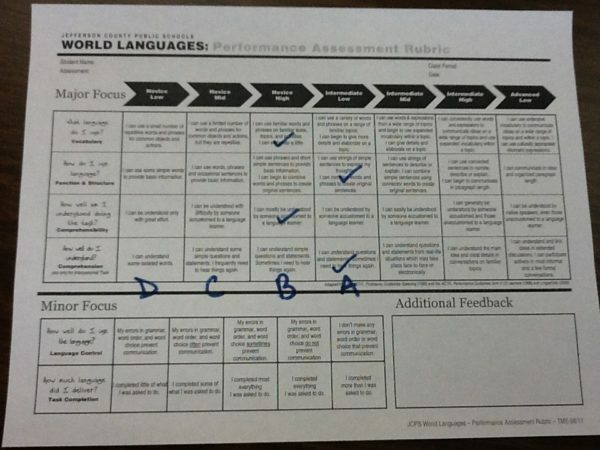 I have been using rubrics very similar to what you gals have here all year, but mine do not reflect language skills in terms of ACTFL’s Novice-Advanced skill levels. I was wondering if you might be able to send me an e-mail attachment of this file, so that I could modify it for my classroom? I was going to make it myself in a word document, but a lot of it was really fuzzy on my computer’s browser so I think it would be easier if I actually had the file. Whether or not you’re able to send me the file, thanks for all that you do here! Thanks for sharing your thoughts. I agree! I love how much people share on here. I consider this as my “department meetings”. I only have the PDF that’s on our JCPS skydive. This is great for presentational and interpersonal, and I am already trying this in my classes! Do you have a good rubric for assessing interpretive tasks? Or what do you use? It is not great but I have an interpretive rubric up on the wikispaces site. I still need to work on tweaking it to make it better. Does anyone else have one? This wiki, http://creativelanguageclass.wikispaces.com/search/view/rub, right? I couldn’t find it on there! Exceeds- Shows complete comprehension of material and ability to infer/predict. Meets- Shows complete comprehension of material. Partial- Shows partial comprehension of material. Lacks- Shows little comprehension of material. It doesn’t give room for low level students trying to grasp just parts of higher level authentic texts or listenings. My question is …after how long do you let your students retake their assessment? I have some students who I know would greatly benefit and take advantage of this opportunity and others who would wait until the complete last minute. This year, I haven’t let my students retake the performance assessments simply because I wasn’t sure how I would do it; obviously for Spanish I, I want them to be able to have very simple conversations by the first couple of weeks of school in which they state their names, places of origin, etc. and there isn’t much to be said for a student who retakes this kind of assessment in January to bring their grade up, with no regard to reaching a certain level of proficiency by the goal time. However, I have realized that not letting my students retake it denies them opportunities to improve, and to prove that they have indeed learned something. For this reason, when it comes to performance assessments next year I’ll do one of two things: Either I’ll let them retake these assessments at absolutely any time, for a maximum increase of some arbitrary amount (around 10-15% grade increase) in order to give them incentive to both show mastery by the goal time and to retake it if they weren’t quite able to do so; or I’ll set a small period of time within which the students can retake these assessments for up to their entire grade back, and then revert to the aforementioned method for the rest of the semester. Does all of that make sense? Does anybody else do anything differently in this regard? It doesn’t matter to me. My goal is that they learn and can demonstrate it. I will cut it off at progress reports and end of grading periods of course. In a perfect teaching world, I would have their grades replace their previous grades. That’s true proficiency grading. You aren’t the only one. 🙂 11 years later and I’m still revising. In #5 how did adding numbers lower their grade? Is it because you factored the minor focus into it? Or is it because you didn’t apply your district’s grading guidelines for that level (don’t know what level that example was for)? Does the minor focus not factor into proficiency either? Not sure how those 2 sentences were related in #2 where you were talking about training. Thanks! Normally I never count the Minor Focus into their overall grade. I should not have included that in the sample, but I was copying from one that I saw someone else do. 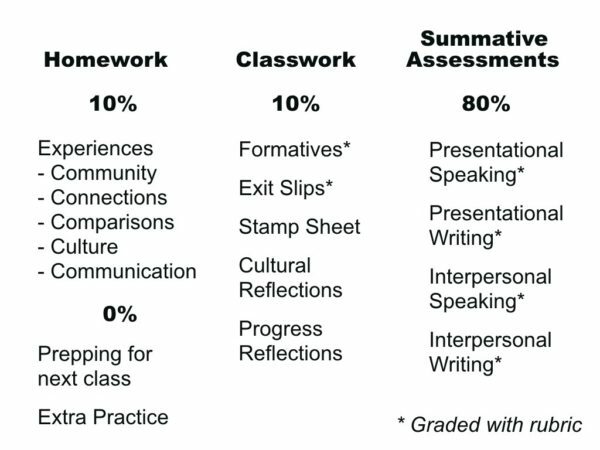 Whether it is included or not, does not change the fact that assigning a number to the boxes, adding them up, and dividing by the possible, would give a lower percentage grade. When I did that, her grade was 77%. But if you look at it, the student is a Novice High+ overall, which is a 90% minimum according to my district’s guidelines for a level 1 student. In your class what percentage is a B? What do you do with the Minor Focus data? Hi Robin! There are so many ways to do this. It really depended on the school’s grading policy but I’ll explain how I did it at a traditional grading kind of school. 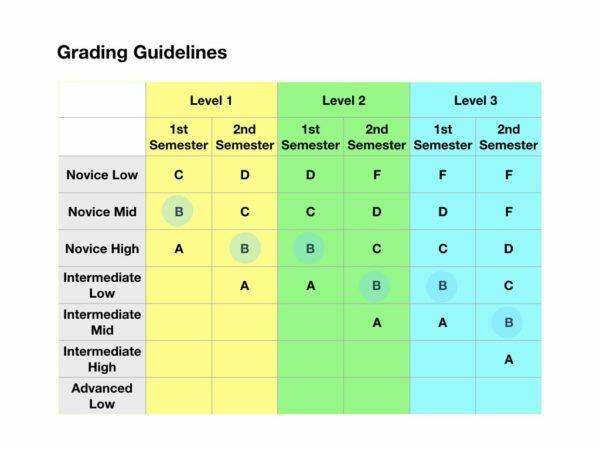 That color-coded image above gave us teachers the freedom to choose what exact percentage we wanted the grade to be for each level. Let me use Level 1, end of the year as the example: Intermediate Low = 100%, In both Novice High & Intermediate Low = 95%, Novice High = 90% (technically I should have made that 89%), In both Novice Mid & High = 85%, Novice Mid = 80%, In both Novice Low and Mid = 75%, Novice Low = 70% It’s not perfect, but it worked. Minor Focus was ONLY for feedback, not connected to grade at all. This changed my mindset in a huge way. Most of those are about accuracy. It naturally happened that as their accuracy improved, their level at the top also improved. Especially at the novice level, they are just excited to communicate! 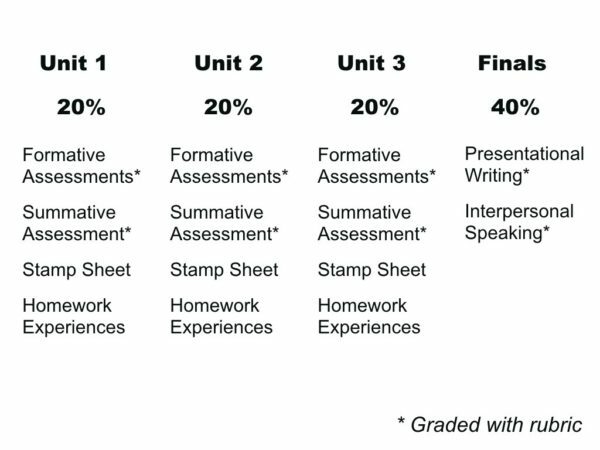 It’s forever the teaching struggle of varied levels and differentiation, while still seeking growth, but having to assign grades in a “fair” way. Are your 1A and 1B classes different? Or is this first half/ second half of a year? 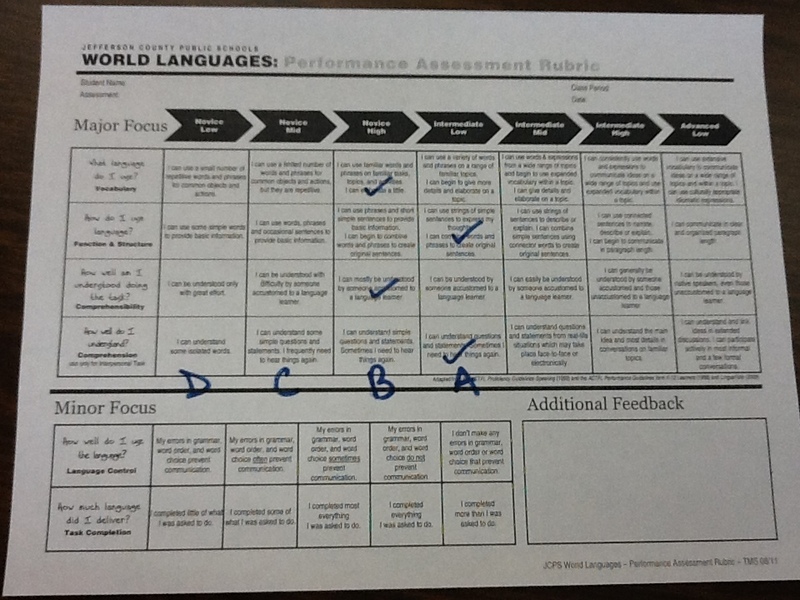 Do you find that you adjust the rubric as students progress through a class? Also, does the MOPI or similar class demand fluency in a language? I doubt I would have the true level of proficiency in Spanish (I’m probably Advanced Mid approaching High?) to administer an official OPI , but would be interested in learning more about distinguishing student proficiency levels. Thanks so much for the work you are doing to encourage and help us all to grow in teaching!! So, SO appreciated! 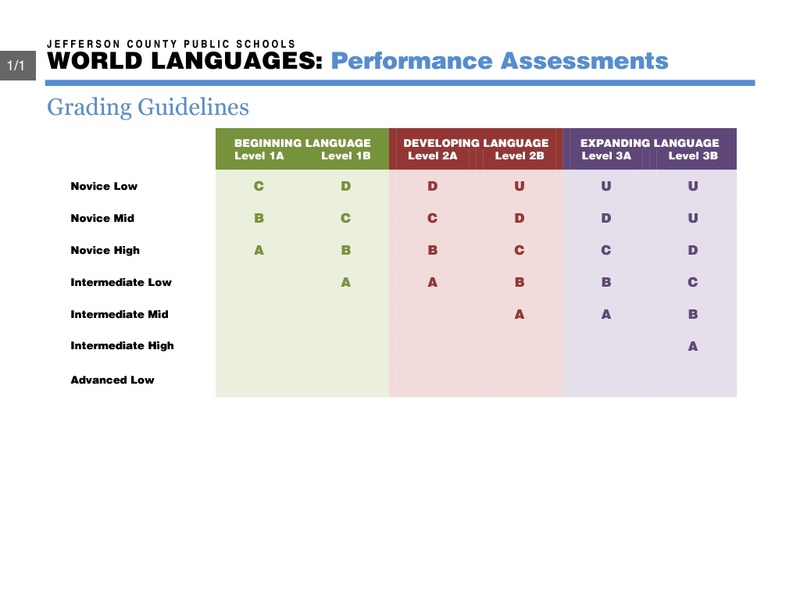 I’m not sure of the exact level someone has to be to be an official OPI rater, but you can look on ACTFL.org about that. I’m not an official rater, but I can definitely assess my students. Check with ACTFL to find out about their trainings. I took 3 days and it really helped. So glad we can help! I just wanted to say MERCI MERCI MERCI!!! I’m a singleton teacher and I wouldn’t be able to make the switch to proficiency if it weren’t for your help. MERCI! Thanks Kyra! I totally relate to being a singleton… pros and cons… I’d love to hear your feedback on how you’re going to adapt it. Can you remind me what the “u” on the grading rubric represents?